He was only ten years old when, in Rome, he conquered Europe for the first time. Them, although always youngest among the contestants, he has repeated this many times at prestigious international competitions. For years they have been calling him a musical prodigy, a boy with golden fingers. 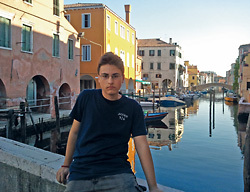 Young, but already experienced pianist Nikola Vučičević, student of the second year of High School fro Music ”Davorin Jenko” in Belgrade, has been attending master classes for several years now with the maestro, professor Konstantin Bogino in Italy. Every time he appears somewhere, he is the master of the stage, he shines, gets awards at numerous international competitions. – I spent my first years on tennis courts. Since my dad Slobodan and elder brother Marko were seriously involved in tennis, it was natural to expect that I would also get into those waters – tells us Nikola on a recent day in May, between his numerous obligations. Polite and humble young man, he captures us with his cheerful look. – And then accidentally, while I was at a store with my father, I saw a piano and said: ”This is what I want”. I simply felt that it was an instrument which I could play, as if I had been destined to be a pianist. Upon my express wish, my parents bought us a piano. I enrolled at School of Music ”Davorin Jenko”. I was lucky to meet there Julija Cvitkovac Glibovski, a pianist and professor of the famous Academy for Music in Sankt Petersburg. She, my best teacher, has been with me from day one, and taught me everything I know. Although he sat at the piano for the first time when he was eight years old, he already knew then that this instrument would change his life. As the beginner, with only one year of studying at the school of music behind him, he begin participating in competitions. 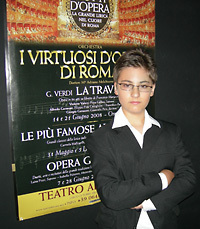 The first competition, in Rome – second place. The beginning of the road to the top. 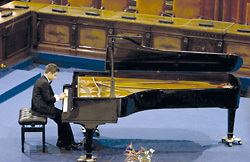 Numerous prestigious international pianist competitions ensued – Padua, Brescia, Bologna, Firenze, Venice, San Sebastian. Germany: first place. – Th eaward in Rome was a powerful motive, I liked what it looked like and I wanted to continue in that way. Epithets ”genius” and ”wunderkind” are an honor, but certainly also a pressure, obligation. – It feels good, but I don’t think much about it. I am not burdened by it. For me it is important that I play well, that I enjoy, that other people feel or recognize that emotion, energy, attitude. There is always certain stage fright, but as soon as I sat at the piano, I adapt myself to it and the stage fright disappears. I feel good with a piano. I try to play my best, and that has been sufficient. I do not think about the fact that I come from a small country. I go there, I play, listen to my peers, they listen to me. I am usually the youngest at those competitions. 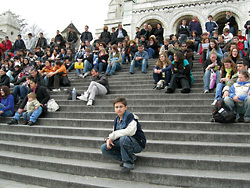 In Italy, when I was 11, I was in the group with those who were 17 years old. I did not pay attention to that either. I give my beast and try to play the best I can. At these competitions, even not winning the award is not a defeat; nobody who does not pay well comes there. It is important that my professor and I are satisfied with what I do and how I do it, to show what I know and what I can in the best way. The biography of this talented young pianist, who has been achieving success in his musical journey for a long time, is also adorned with the fact that he has almost absolute pitch. he hears, memorizes, and can play it. He plays with his soul. 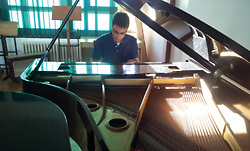 He practices piano 2-3 hours every day, and when preparing for a competition even more. There are also other school and numerous other obligations, advancement, singing in the school choir (tenor). Obligations are an indispensable part of Nikola’s growing up. – Talent is what matters in the first few years, and then the work is decisive. I enjoy music and it is not difficult for me to play for several hours every day. It is also not complicated to arrange all the obligations. When you schedule everything well, you can do everything, practice everything. In achieving all this, the support of professors, friends and, after all, he says, support of his family is priceless. Mother Nataša is fully dedicated to him, she follows him and makes his obligations easier, she has been with her son on all his journeys. Although music is his world, his joy and magic, he also likes to spend free time at a computer, to watch movies, to read, novels are his favorites, to walk, with mandatory jogging for fitness, to listen to various sounds – jazz, evergreen, rock, reggae, pop. 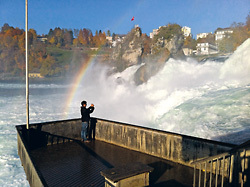 He has many interests, including travel, enjoying all the interesting sites, visiting churches, monasteries. He also likes spending time with friends. – I don’t have much time for friends, because of my obligations, school program, preparations for competitions. These are mostly friends from the school of music. We go out together, have our parties. We have wonderful time. We are a different world, we are mostly interested in music. Favorite composer of the young pianist is Chopin, before all, then Mozart, Beethoven, Schuman, Rachmaninov. And his dream? – My dream is to get better, to play better and better, to perform in various concerts, maybe with an orchestra, for example, with Berlin Philharmonic. And I would also like to participate at the greatest Chopin competition in Poland. Maybe this wish will come true next year. Or in two years. 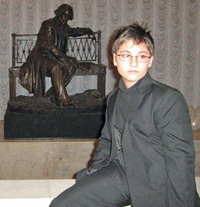 ”Wunderkind”, ”Musical Genius”, ”young pianist in European top”, Nikola Vučičević says, modestly, that he is only a sixteen years old who loves music before all. Piano forever. Nikola Vučićević wan awards and acknowledgments in Rom, Padua, Brescia, Bologna, San Sebastian, Sankt Petersburg, Moscow, Paris, Brussels, Arezzo... The crown of these successes is certainly the first place at the Sixth International Competition dedicated to the work of German composer Cramer, in November last year, in a German town Sankt Georgen, on Schwarzwald, in the category from 15 to 18 years of age. An important place among Nikola’s awards is the Acknowledgment for special engagement and spiritual advancement during his studies, which was awarded to him, with a blessing of His Holiness Irinej, Serbian Patriarch, in mid 2010. While he was in the elementary school, he also won ”Golden Reader’s and Spokesman’s Badge”, he received Vuk’s Diploma for maximum results during eight-years long education. He completed seventh and eight grade in one year, and completed his entrance exam at the School of Music in 10 minutes. He speaks English and German, which he adores, and Italian when he has to.